Watch the Moon Swing by Jupiter Tonight! 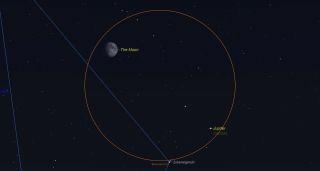 Starting in the southern sky after sunset on the evening of Saturday, June 23, the waxing gibbous moon will sit less than 4 degrees to the upper left of bright Jupiter. The two objects will cross the sky together during the night, with the sky's rotation carrying the moon higher and above Jupiter after midnight. Meanwhile, the moon's separation from the bright planet will noticeably increase as the moon slides eastwards in its orbit. On Saturday night (June 23), should local weather conditions permit, you'll be able to enjoy a view of a waxing gibbous moon hovering near the "king of the planets," Jupiter. Both will be about halfway up in the southern part of the sky as darkness begins to fall. The moon, which will be three and a half days past first-quarter phase — 85-percent illuminated by the sun — will be situated just above and to the left of Jupiter, a distance measuring roughly 4 degrees. Here's how to gauge how wide 4 degrees is: Your clenched fist held at arm's length is equal to roughly 10 degrees, so Jupiter and the moon will be separated by less than half a fist on Saturday night. In addition, the moon measures one-half of a degree wide. However, because of an optical illusion, the moon actually appears twice as big as it actually is. So, while the separation between the moon and Jupiter seems like it should be equal to eight moon widths, when you see them in the sky Saturday evening, the two will appear to be much closer — to some, perhaps less than half the predicted "eight moons wide" distance. For the moment, however, Jupiter ranks as the third-brightest object in the night sky and does not set until around 2:40 a.m. local daylight time. As twilight fades, it is soon joined by the bright stars of late spring and early summer. When you sight the moon and Jupiter on Saturday, for instance, don't overlook the 2.8-magnitude star Alpha Librae, also known as Zubenelgenubi, situated just to Jupiter's lower left. A pair of simple binoculars will reveal that this is a double star, and some say it possesses a faint greenish tinge — the only known green star visible to the naked eye. Jupiter may be the best planet for amateur astronomers to observe; viewers with the smallest telescopes, or even steadily held binoculars, will be able to identify its bright moons, and its disk shows more illuminated surface area than all the other planets combined. For those with large telescopes (with an aperture of 6 inches or more), Jupiter's cloud belts are readily visible. So is the famous Great Red Spot (GRS), a giant storm that has been raging on the planet for several hundred years. Skywatcher Frank Melillo captured these images of Jupiter spinning over the course of a night on June 16 in New York. The shadow of Jupiter's moon Io can also be seen crossing the disk. An assiduous planet observer, Frank J. Melillo of Holtsville, New York, has provided Space.com with an interesting montage he shot recently. On June 16, he captured images of Jupiter that show the planet's rapid rotation effect as the Great Red Spot crossed the disk. Also, notice the circular shadow of Io, one of Jupiter's moons, moving across the disk. "It is a good [photo] to show that the GRS is very strong in color this year. Note that it is brick red," Melillo noted. "The North Equatorial Belt (NEB) is darker, thinner and very choppy. Some bluish festoons are seen … on the edge. The South Equatorial Belt (SEB) is wider with a thin streak. Some fainter belts and zones are visible in both polar regions." And one final thought: If clouds hide your view of the moon and Jupiter on Saturday, don't worry — they'll be together again on July 20. Joe Rao serves as an associate at New York's Hayden Planetarium. He writes about astronomy for Natural History magazine, the Farmer's Almanac and other publications, and he is also an on-camera meteorologist for Verizon FiOS1 News, based in New York's Lower Hudson Valley. Follow us @Spacedotcom, Facebook and Google+. Original article on Space.com.